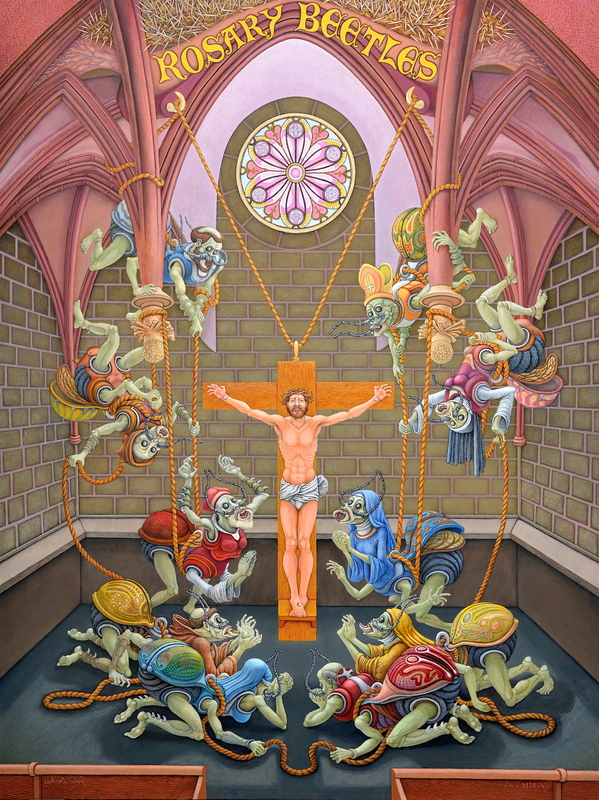 This entry was posted in art, oil painting and tagged art, beetles, crucifixion, drawing, golden cord, golden thread, grotesque, insects, Jesus, Jesus on the cross, metamorphosis, oil painting, outsider art, Rosary Beads, Rose window. Bookmark the permalink. You cannot imagine how much this painting appeals to an old monastic school graduate, like me. The manipulating beetles set a recovering catholic to applying their characteristics to all the needy, dependent, weird and dysfunctional people who inhabit the institutional church world. And the detailed, pre-painting, pencil studies, add to the renaissance feel of the work. It took a while for me to realize why I felt something was missing – there is no altar behind. This is an indication of how completely the catholic virus has embedded itself in me, not a reflection on the quality of the painting. The open space behind is probably more poignant than the usual background clutter of these renaissance “ascension” portraits. I’m delighted this painting appeals to you, Tailless Monkey. The on-line reproduction here doesn’t do it justice. It looks better in person. I’m interested in contemporary things but I also have an Old Soul and love the Renaissance masters, and even going further back in time. Cathedrals, altar pieces, illuminated manuscripts, I love all these things, the craftsmanship, the devotion of those who made them. If my mind wasn’t so scattered and made schizoid in this contemporary world we inhabit, so many things of transient and dubious value in it, our energies sucked out of us by so many distractions, I might have produced more work along the lines of this one by this time in my life. I really should paint more like this. I have an idea for a triptych I’d like to do, in old style, which I made some drawings and sketches for, but it seems like such a distant thing to me presently that I could accomplish it how I envision it. I’m still sketching and working out the ideas for it. This painting means a lot to me personally. I’m proud of its composition, all the parts related to each other – connected – and fitting nicely within the whole. The painting could be interpreted in more than one way. I don’t consider it an outright attack on religion. It’s more complex than that. It’s of course satirical on the most obvious level, what you’ve pointed out certainly being there. Religious fanatics who harden themselves in ideology, develop a kind of exoskeleton, like military armor; and they have no mind’s eye, but a blindness about them, antennae feeling around in space. I think the satire and any irony the painting may have is not vicious however but objectively subdued, thought definitely predominating over expressive emotion. It can be considered an expression of my loss of faith, the inability to believe, but also an homage to those artists and craftsmen of the distant past whose work I still adore and return to for inspiration, despite my inability to believe as they may have believed, being of a different time. It’s a curious position a contemporary man finds himself in. Another interpretation is: How I feel about Man generally, in relation to the idea of Divinity, how Man might really look in relation to its embodiment. Note that I didn’t distort the depiction of Jesus. He hangs there in natural human proportion. The “human beings” around him are the ones who have transformed into monstrosities. I think of what Albert Camus wrote: “Man is the only creature who refuses to be what he is.” What would Man look like if he was touched by a spark of Divinity and instantly turned into what he really is inside? Sincerely, thanks so much, Tailless Monkey, for leaving a comment here and giving me an opportunity to explain this painting a little more. I really appreciate it!